Note: Although I have not used quotation marks, much of this blog post quotes the people to whom I have ascribed comments almost verbatim. I made slight stylistic and mechanical edits to account for the fact that presented in this format, I do not have the constraints that Twitter imposes on users. Where meaning is unclear or erroneous, I bear full blame for the mistake. Background: I joined a single family office in December 2008 as the second employee on the team, and as the first employee on what would become the direct investing team. In January 2011 we started building a venture fund from the ground up, KEC Ventures. It grew to $98M of assets under management distributed across a $35M 2011 fund and a $63M 2014 fund, with 51 investments in aggregate. I left KEC Ventures in September 2018. You can read my reflections on my time at KEC Ventures here: #ProofPoints. I have now teamed up with Lisa Morales-Hellebo to build an early stage fund to invest in startups building innovations to refashion global supply chains. We’re in the early stages of raising the fund, so I am thinking through the issues that every emerging fund manager grapples with. We are simultaneously building The New York Supply Chain Meetup, and The Worldwide Supply Chain Federation – more about that at the end of this article. This blog post is a qualitative examination of issues pertaining to portfolio construction and portfolio management, from the perspective of a seed-stage manager who is managing a Fund I portfolio that falls somewhere between $10M and $25M of AUM. It is based on a discussion that occured on Twitter in early February 2019. It is my belief that the seed-stage technology venture capitalist’s only goal is to benefit disproportionately from uncertainty. To do this the best seed-stage venture capitalists seek startups that fit an investment thesis, and make investments before other investors would normally invest. When I think of uncertainty, I am thinking of a state of affairs in which I have limited information and knowledge, and must make a decision whose outcome I can’t predict because the future is unknown and unknowable. I do not think one can measure uncertainty quantitatively. When I think of risk, I am thinking of undesirable future outcomes some of which I can enumerate quantitatively. A startup is a temporary organization built to search for the solution to a problem, and in the process to find a repeatable, scalable and profitable business model that is designed for incredibly fast growth. The defining characteristic of a startup is that of experimentation – in order to have a chance of survival every startup has to be good at performing the experiments that are necessary for the discovery of a successful business model. This is the definition I have in mind when I speak of a startup. Early stage venture capitalists will typically invest before search and discovery is complete. This definition is based on a definition by Steve Blank, to which I have added the characteristic of fast growth based on Paul Graham’s observations. In the remainder of this post, I try to synthesize and organize the comments that arose from my original question on Twitter. I add some commentary of my own where I feel it will be helpful. I am always thinking about this topic so if there is other material you think I should read please send it to me. The easiest way to do so is via Twitter: @brianlaungaoaeh. I assume that the reader is already familiar with the basics of VC and how a venture fund is structured. If not, here’s a decent introduction from the Harvard Business Review: How Venture Capital Works. Note: When I make references to modeling portfolio construction for REFASHIOND Ventures’ first fund – which we are in the early days of raising, I am using a spreadsheet model template developed by Taylor Davidson at Foresight. I have known Taylor since 2013 and I couldn’t recommend his work highly enough. The data below from Correlation Ventures, and CBInsights is pretty self-explanatory. Correlation Ventures’ data looks at individual financings rather than at individual companies – one company can have multiple financings. The data from CBInsights looks at individual startups, where, similarly, one startup can have multiple financings. My conclusion, based on these two pieces of analysis, is that an early stage VC should expect that at least 50% of the startups in any given fund portfolio will lose all the money that the VC invests in them. The data from Correlation Ventures suggests an even more grim outlook – though as you’ll see later it is somewhat less categorically conclusive. However one looks at the data, the conclusion is sobering. To put the data in context, for a while the rule of thumb was that 33% of the startups in a VC portfolio would go to zero, another 33% would return invested capital, and the remaining 33% would do significantly better – resulting in the 3x net return that limited partners expect. 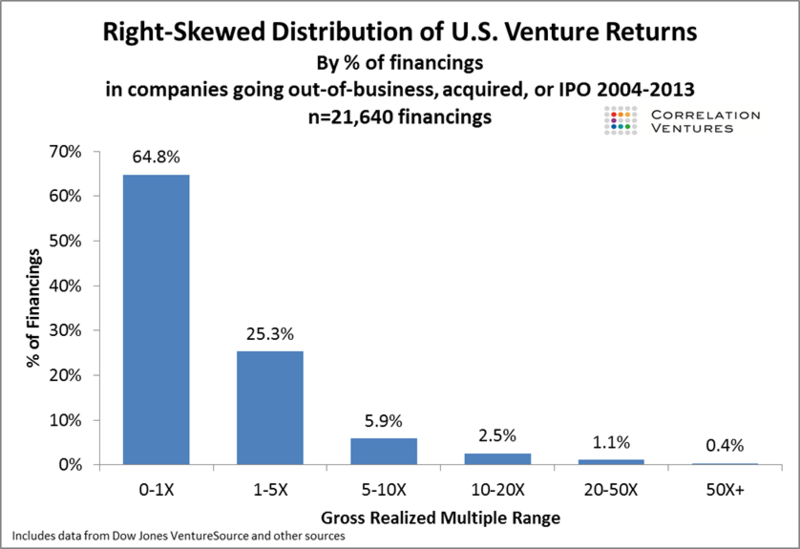 According to this historical distribution of returns data compiled by Correlation Ventures, 10% of financings provide over 5x return while 65% are partial or complete write-offs. In this analysis by CBInsights, less than 50% of startups that raised a seed round in the United States between 2008 and 2010 were able to raise a subsequent round of capital. Given this state of affairs, how do different VCs think about portfolio construction and portfolio management? If you are a family office, an individual, or a corporation getting into venture capital as an asset class for the first time, and if you are investing in a manager who is raising their first fund, what should you be on the lookout for? I hope this helps frame the issues worth considering. Note that the discussion documented below centered around the data from Correlation Ventures only. I have not included every response to my tweet, only those I feel contribute directly to the topic. It is possible I have missed a few replies because the thread started branching off in several directions after a while. Eliot Durbin (@etdurbin) from Boldstart Ventures: Two nuggets of advice I got on our early funds . . . expect 20% of portfolio to drive 80% of returns. Pay attention to founders that get those 1x – 3x returns on their first rodeo, because the next will be better. Also, third, plan your percentage reserves for follow-on investments because ownership in your winners matters most. Jerry Neumann (@ganeumann) from Neu Venture Capital: It means you have to make enough investments so that you have a decent shot at being in some of the outliers. The expected value here is at least 1.2x. Hadley Harris (@Hadley) + Nihal Mehta (@nihalmehta) from ENIAC Ventures: The key is to build out two models. The first is a fund model with number of companies and projections about how broad/deep you follow. The second is a liquidity model to project when money will come back for recycling, and the triggers for investing past initial investable capital. Note: The process of recycling capital allows the fund to gain leverage without exposing limited partners to additional risk beyond their capital commitment. Albert Wenger (@albertwenger) from Union Square Ventures has blogged about uncertainty for some time, and he discusses this topic in this installment – arguing that because this distribution is now well understood, valuations are being bid up significantly. This puts small funds at a disadvantage, and contributes to the phenomenon whereby VCs raise larger and larger subsequent funds. It’s a brief post. You should read it. VC has always been a power law business, so big hits drive portfolio returns . . . and the big hits are getting bigger, but on the other hand, pricing going up is going to cut returns, not only of the big winners, but also of the middle OK part of the portfolio. But everyone’s bought into the power law dogma, so unicorns are getting bid up, often with pricing for perfect execution, following winds, and fair seas . . . any hiccup (systematic or idiosyncratic) will lead to a lot of stranded unicorns, or as Bryce (of Indie.VC) calls them, “donkeys in party hats” . . . Speaking of which, I think his efforts over at Indie.VC have been a creative and thoughtful search for Opportunity in the context of Value – remember, Opportunity = Value – Perception. At the end of the day all that matters is Moolah in da Coolah – the distributed to paid-in-capital multiple that a fund ultimately achieves. Here was my effort at thinking about some of these portfolio construction issues in the context of valuation environment: All About the Benjamins. But I remain really nervous about the environment. As Henry McCance at Greylock told me in 2001, VC works well when time is cheap and capital expensive. When that relationship is reversed, trouble ensues. This means you should do a LOT more deals, unless you pick better than Sequoia. Of course depends on dealflow, selection, and stage, but if you start investing at seed-stage, most GPs with portfolios with N < 50 companies are playing Russian roulette. If large outliers of > 20x happen only 1% – 2% of the time, basic math would suggest a portfolio size of N > 100 is more rational. [My comment; Yes, The basic math certainly supports that conclusion. Though, I wonder if there are nuances the basic math doesn’t capture. Do you think there are conditions under which one might justify deviating from that prescription?] Well if you’re a subject matter expert and/or have excellent access to dealflow or an established brand, you might choose to build a concentrated portfolio – but again you’d have to convince yourself, hopefully based on data, that you’ll generate a higher percentage of outliers than the average VC. [My comment; Got it . . . Though, one has to wonder if there’s such a thing as a subject matter expert when it comes to predicting how the future will unfold. But, I see why that approach would make sense – in some rare cases. Who would you say does that really well? Anyone? CVCs?] Well for specific IP-related areas, people who are scientists/PhDs/professors might have an advantage. For industry verticals, maybe experienced business or technical folks. Famous people and/or famous VC firms might also have an advantage. Not sure about CVCs, unless specific IP perhaps. In my experience the skew is almost systematically massive. With one fund returner – your fund is likely to be fine, with two – it’s likely to be great, etc. The top 2 to 4 exits will likely more than 2x+ the fund, the next 5 to 8 exits together will return 1x the fund, and the rest might lose some money. Hence I’m always thinking – never invest in anything that can’t return the fund – which is, of course, a function of ownership and upside, with upside uncapped if you want to have a shot at a “glimmer of greatness”. Never invest in anything that can’t return the fund. Note: At this point I shamelessly plugged my work on Economic Moats: Economic Moats for Early-stage Tech Startups (Half a Dozen Blog Posts & A Presentation. Also, note that there’s a philosophical divide about economic moats and startups among VCs. Some think they matter. Others do not. I think they do, and I think a careful analysis of the issue leads to that conclusion for startups that will go on to return an entire fund, for example. However, I also agree with the observation that at the the earliest stage of a startups existence the thing that matters most is the startup’s ability to make its customers happy as it conducts the search for a scaleable, repeatable, and profitable business model. An economic moat is a structural feature of a startup’s business model that protects it from competition in the present but enhances its competitive position in the future. This is the definition of an economic moat I have settled on, based on my work thinking about the topic from my specific vantage point as an early stage VC. What is your return the fund exit (RFE) for each investment assuming dilution? Sean Glass (@SeanGlass), Founder and CEO – Advantia Health. Founding Partner – Acceleprise; What was the return on that meta portfolio? I think the role of vc as investor is to generate alpha, and you do that by taking an approach that gives your portfolio asymmetric risk. Just like with public equity investing there are a different approaches to doing that. I wouldn’t go as far as to say the data is completely useless, though I see the argument Arjun and Jerry are making. If one assumes that the two sets of data suggest possible probability distributions, then I think the interpretation should be that; First, any portfolio construction that assumes less than 50% of the portfolio going to zero is almost certainly naively over-optimistic. Second; assumptions about big winners should be scrutinized closely because they are rare – so fund managers should be able to explain how they will attract dealflow that will include more than their fair share of potential fund-returning startups AND the processes they have developed to maximize the chance that they actually select those startups for inclusion in the fund’s portfolio. In my work on modeling portfolio outcome scenarios for REFASHIOND Ventures’ first fund, I have gone as far as assuming 90% of the portfolio goes to zero. I have not modelled 100% of the portfolio going to zero because that’s obviously the trivial case – if that happens we’ll most certainly have bigger problems to worry about. Most of the time spent in discussions between prospective limited partners and the venture fund’s general partners should be in arriving at underlying assumptions that reflect reality and can be justified by how the general partners have said they will run the fund, with enough flexibility to allow the fund to exploit unforeseen and unexpected opportunities as they arise in real-time – remember that optimizing luck is an important aspect of all this. Correlation Ventures has not made public a version of this analysis that presents the results in a manner similar to that done by CBInsights. It is likely that they were unable to get to that level of granularity given the source data, or they may prefer to keep that specific version of the analysis as a trade secret. Early-stage Venture Capital is a system for running experiments. It’s the nature of experiments that some fail – the key is for the ones that work to really really work. There’s definitely that tension. In an ideal world you’d have enough capital and enough early, but predictive, data to consolidate into your best companies. Larger “Series A” funds do that regularly, but with a seed fund you have challenges with both capital and information. You have a small fund and by the time you have to make a follow-on decision, or more ideally preempt a round, you don’t really have that much more data about the opportunity. That’s really the argument for placing as many early bets as possible. This also calls to mind a quote from Andy Rachlef, formerly of Benchmark Capital; Investment can be explained with a 2×2 matrix. On one axis you can be right or wrong. And on the other axis you can be consensus or non-consensus. Now obviously if you’re wrong you don’t make money. The only way as an investor and as an entrepreneur to make outsized returns is by being right and non-consensus. This article by Tren Griffin delves deeper into the topic: Why Investors Must Be Contrarians to Outperform The Market. Investment can be explained with a 2×2 matrix. On one axis you can be right or wrong. And on the other axis you can be consensus or non-consensus. Now obviously if you’re wrong you don’t make money. The only way as an investor and as an entrepreneur to make outsized returns is by being right and non-consensus. Note: At a certain point in the discussion on Twitter a side-bar discussion developed about how much help seed-stage venture capitalists should provide to startups in which they have made an investment as those startups search for product-market-fit. I am not including those here as that is a separate topic worth exploring on its own. Note: The following discussions were not part of the thread that formed from my question on Twitter, but they are relevant, and so I am including them here. Samir Kaji (@Samirkaji) from First Republic Bank; Shared an article by Clint Korver of ULU Ventures: Picking winners is a myth, but the Power Law is not. It is worth reading Clint’s article because he introduces some added dimensions to the discussion. Here’s additional advice from Samir, some of which I got over email, and then during a call with him when Lisa and I told him about REFASHIOND Ventures. I have also cherry picked comments from some blog posts he’s written on the topic. To maximize the probability of success, fund GPs raising a first fund should perform the portfolio construction exercise based on their investment thesis, their knowledge of the market in which they plan to operate, and how much capital they need to prove that they can execute the thesis. Although, macro considerations are always a concern for managers raising their very first fund, this exercise should be performed independent of considerations from prospective LPs who make comments such as “You should not raise more than $X for your first fund.” In other words the dog should wag its tail, not the other way around. He discusses that topic here: Is there ideal portfolio construction for seed funds? Although many will pejoratively speak of large portfolios as “spray and pray”, doing so ignores years of probability and statistics, and likely over-weights skill versus luck. That said, larger portfolios do come with some challenges: Scaling value-add to portfolio companies. Requiring larger exits (given smaller initial checks/ownership vs. concentrated portfolios) for definition of outlier (fund returner). Tougher to make follow-on decisions. As conversations progress, more sophisticated LPs may want to discuss the key assumptions driving the sort of scenario analysis I described earlier. Clint performed a simulation to arrive at the conclusions in his article. Demonstrate an ability to execute the fund’s stated portfolio thesis, portfolio construction and portfolio management strategy under real world scenarios. This is by no means an easy task, and it is only one of the many issues an emerging manager raising a first fund must worry about. As has been reiterated more than once previously, it requires hard work, smarts, keeping one’s wits about oneself, and a fair bit of luck. The Worldwide Supply Chain Federation is the collaborative, and mutually supportive coalition of open and multidisciplinary grassroots communities focused on technology and innovation in the global supply chain industry. Founded in August, 2017, The New York Supply Chain Meetup is its founding chapter. The New York Supply Chain Meetup is the world’s largest, fastest growing, and most active community on Meetup.com – with well over 1700 members. The Worldwide Supply Chain Federation is the first community of its kind to focus on supply chain, innovation, and technology. It seeks to bring together BUYERS and BUILDERS of the technology innovations that will refashion global supply chains. Update: March 23, 2019 at 08:32 to fix some mechanical errors, typos, grammar. Also added definition of a startup, and definition of an economic moat, and highlighted some quotes.